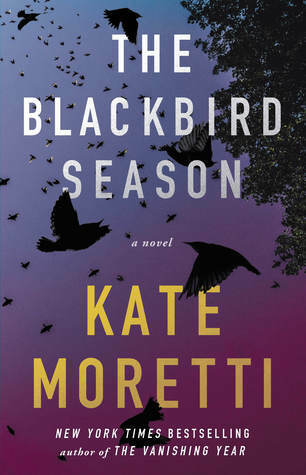 In a Pennsylvania town where crime rarely happens, a thousand dead starlings fall out of the sky. Seemingly, this sets off a chain of events that will change the lives of many. This book is unfolded through the POVs of four different characters. We have Nate, baseball coach and adored teacher who probably pays a little too much attention to his students. His wife, Alecia (it was spelled this way in my arc copy), who is home tending to their special needs son, Gabe, while thinking her husband avoids the house. Her frustrations of having to hold herself together for her son's sake leads to instigating arguments with Nate. Then there's Bridget, also a teacher at the same school, closest friend to Alecia and a widow who may be the only one fighting for the truth. Lucia, an eccentric student, outcasted by her peers who call her a witch, accuses Nate of having an affair with her and then promptly disappears. Nate was the last one to see her but all evidence proves to Nate's guilt. With only one person by his side, can he prove his innocence (if he truly is innocent), save his marriage and reputation? And if he didn't have this alleged affair, then why is he being accused? Under her twitter handle, Moretti says "best selling author of crap marriages & murder"... and she's absolutely right! Holy crap marriages in The Blackbird Season! Moretti is wonderful in the character building of this story. Even with the multiple view points and the flip from from past to present throughout the novel, I never felt lost. This isn't a book where you get one huge twist that makes you gasp and hold your chest. It's rather a more suspensefully nuanced psychological thriller that keeps you turning the pages as she brings the story full circle. This was the perfect read for what I needed at this time. She doesn't try to surprise you or catch you off guard. Instead, she slowly builds this world where none of the characters are likable, but you still want to sort of root for them. At least I did. There's a slight supernatural undertone which I also liked a lot. At the end of the day, this rule stands true - don't piss off a female... EVER. For those who love that suspenseful thriller that might not keep you on the edge of your seat, but will definitely pull at your curiosity strings, this is something you need to pick up. This was my first time reading a book by Kate Moretti, and I was not disappointed! 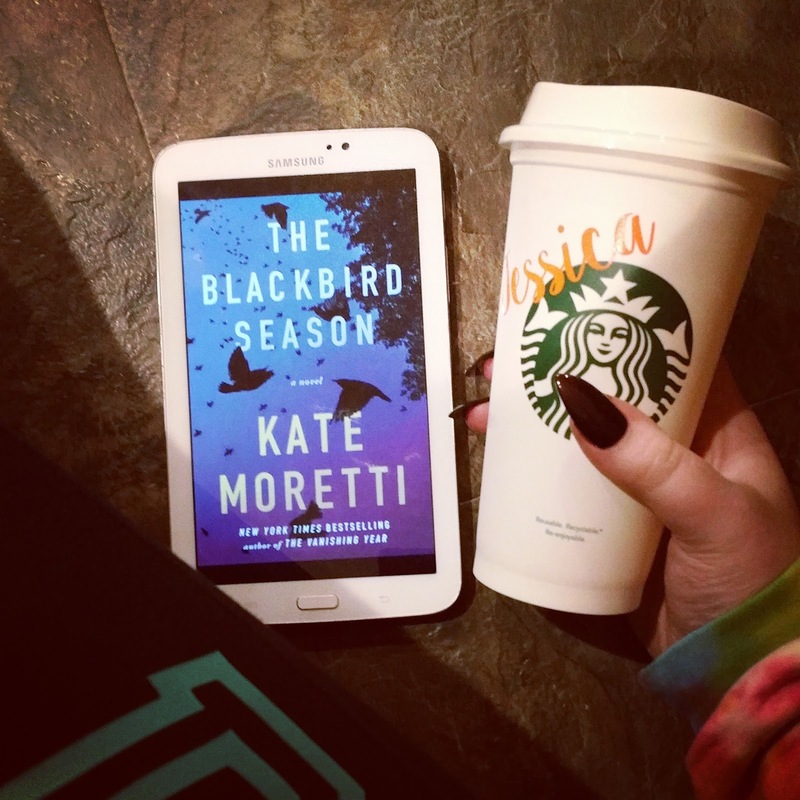 THE BLACKBIRD SEASON was definitely a suspense novel that kept me pulled in throughout the book. It was a fast and enjoyable read!Mount Oanoke, Pennsylvania is a small town where crime is rarity. One day a thousand starlings fall dead out of the sky. The town has their theories - was it man to blame (air pollution) or was it something supernatural (perhaps a sinister omen). Soon after, a series of disturbing events follows that will change the lives of many people in town. When baseball coach and teacher, Nate Winters, is accused of having an affair with a student, Lucia Hamm, things begin to spiral. Especially when Lucia disappears. Is Nate behind the disappearance? Does Lucia have something to do with the eerie events happening in their small town?We jump from different perspectives throughout the chapters. We see through the eyes of Nate Winters, his wife Alecia, fellow teacher and Alecia's friend Bridget, and then Lucia. 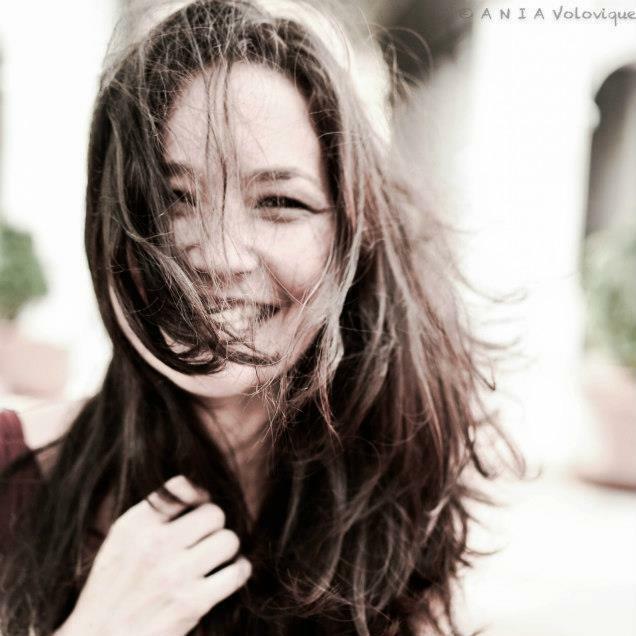 Moretti creates very intricate and complex characters for the readers. Alecia, wife of Nate, is at home with her autistic son, Gabe, and is struggling to keep it together with the absence of her husband. Bridget is another teacher and seems to be the only one that is trying to get to the bottom of what really happened between Nate and Lucia. Then we have Lucia, a student that her peers have labeled a witch. Is she who is causing the starlings to fall from the sky? Where has she disappeared to? I felt that Moretti did a great job weaving this story together. How all the characters and timelines mixed made for a great mystery. She also does a phenomenal job painting the scene for the readers - the old mill town and everything that comes with it (pollution, lack of jobs, and the issues that follow). Overall, if you want a slower building suspense with an intriguing mystery, then this is the book for you! There were complex characters that intertwined perfectly along with a good pacing throughout. 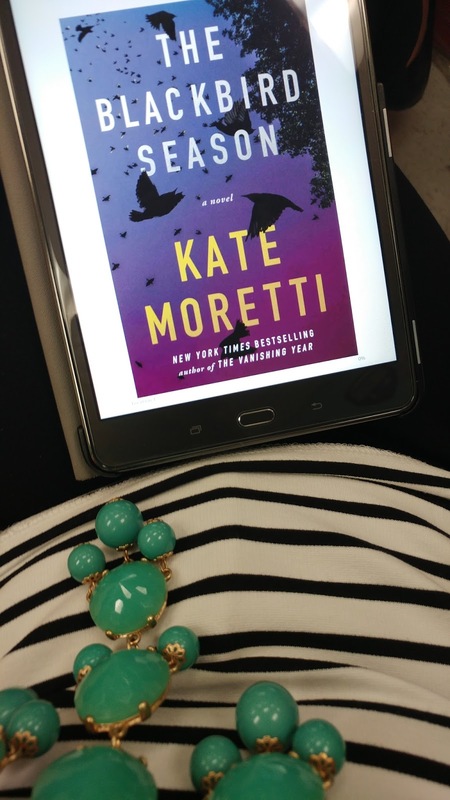 I"ll be looking for more from Kate Moretti! Last year, I read (and loved!) The Vanishing Year by Kate Moretti, so I was thrilled to find out that #cjsreads had obtained copies of her sophomore novel, The Blackbird Season as one of our September picks! I had absolutely no expectations going into this book; truthfully, I loved The Vanishing Year so much that I didn’t even read the synopsis of this book. I figured that if Moretti wrote it, I would be interested. I was right! Moretti was able to weave a pretty stellar, mysterious novel within these pages. One that left me binge reading late into the night. This story surrounds high school teacher, Nate Winters as he is accused of having an affair with a female student, Lucia Hamm. As Nate’s life spirals and Lucia goes missing, Nate is the only suspect. As his wife, Alecia begins to question his situation, his only ally comes in the form of co-worker and creative writing teacher, Bridget, who realizes the only way to save Nate’s reputation could be using Lucia’s journals. Though marketed as a psychological thriller, I didn’t find that this one fit that bill in the traditional sense. When I think of psychological thriller, I think of a fast paced, on the edge of your seat, mind-bending plot filled with unreliable narration and lots of “WHOA” moments. In this case, I felt Moretti created more of a slow burning mystery. What happened to Lucia? Who is telling the truth? What is the deal with all these birds? For me, this absolutely worked. Generally speaking, choppy and disjointed narration usually gets on my nerves, but, somehow, Moretti manages to make this style of narration easy to follow and completely addictive throughout the plot of this tale. I was on the edge of my seat as I devoured each chapter (both and back and forth in time) and tried to figure out what the true happenings were and what motives the characters were acting with. Each character gets a distinct POV and I loved hearing the story from each of their perspectives. I found this to be incredibly interesting. One of my largest gripes to this story was the situation with the birds. At the beginning of the story, we are told that thousands (hundreds? millions? Who knows) of blackbirds have fallen out of the sky and into the town. People are horrified by this phenomenon and experts are called into the test the town’s water and air, looking for reasons and possible side effects of this occurrence. I waited for the entirety of the book for this to be made clear. And, alas, there was never really an explanation. The birds were more of a metaphor or a representation and I just wasn’t about that. Personally, I felt like I needed an explanation. Overall, if you enjoy a tightly woven plot with multiple characters and a compelling mystery, I think you will enjoy this book. It really reminded me of Everything You Want Me To Be by Mindy Mejia. They both had that small town mystery vibe. Big thank you to Atria Books for these copies in return for our honest opinions.